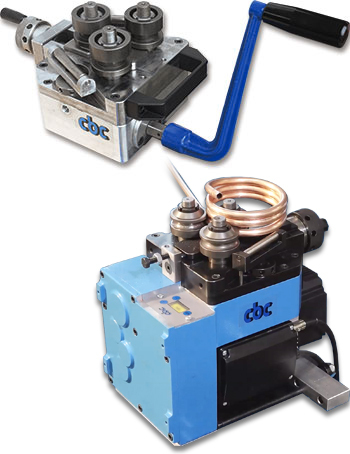 The mini ring rolling machines are suitable for ring rolling sections, flat bars, and metal pipes with ring rolling angle from 0° to 360°. The warping of the material is carried out by the operating arm (for the hand mini ring roller) and by a geared motor (for the electric mini ring roller). By the use of optional accessories it is possible to bend metal pipes from 0° to 180°. - Maximum ring rolling angle 360°. - Asynchronous motor 0,18 KW 230V/50HZ RPM 1400 (electric mini ring roller). - mm-sized dimensions and weights 160x310 h. 165 - kg. 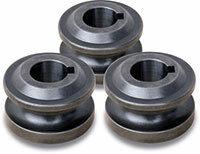 14 (hand mini ring roller), 180x280 h. 260 - kg. 23 (electric mini ring rolling machine). 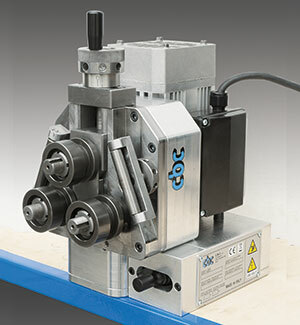 The electric mini ring rolling machine can be used in the vertical position too. 3 universal rollers (included in the standard equipment). 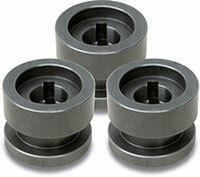 Round pipe rollers (optional items, 3 pieces for each size).